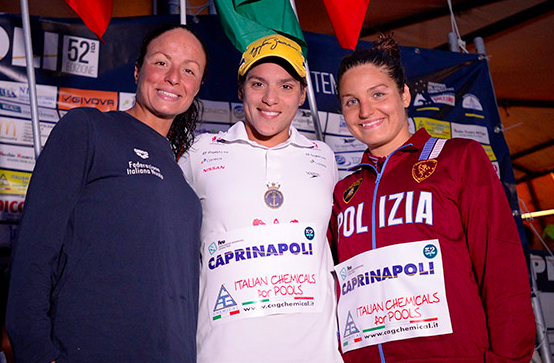 While the men raced in packs with a sprint to the finish at the latest FINA Open Water Swimming Grand Prix race in Italy where the top swimmers were only separated by seconds, the finish at the women's race at the 52nd Maratona del Golfo Capri-Napoli on September 3rd was one of the most unusual competitions in recent memory. Very unusually, there were more non-finishers than finishers, including those athletes who finished Over The Time Limit (OTL) or Did Not Finish (DNF). But long-time regular podium finisher Ana Marcela Cunha of Brazil won the race by a dominating 10+ minutes. Additionally, the separation between second-place Alice Franco and third-place Ilaria Raimondi was over four minutes. The entire field was separated in the most unusual fashion.